One of my favorite periods in American art is the period immediately following World War II, roughly 1945 through 1965. It was a period where the men who fought that war—and those who stayed behind to keep the nation running smoothly—agonized over its ultimate impact. Make no mistake: They very much thought that taking out the Axis had been the right thing to do, but they also struggled with the human toll of that war, all of the people who died or were injured or fell into madness. The imperative, then, was to make sure something like this never happened again, to make war ultimately a disappeared invention, no matter how difficult that would be. The ultimate result of the war had been worth the cost on the way to that point, but the cost had been so, so high on all sides, not to mention the arrival of the atomic bomb, a weapon that could easily end humanity for all time. For many of these artists, war was no longer a way for young men to win glory; it was a dehumanizing slog. Now, there will always be artists who celebrate war as a time when men can be at their very best. It’s one of our oldest “genres,” and there have been some damn good stories in that genre. And it’s not like the anti-war tale was new to the U.S. or even writing in general. But there was this flowering of art that questioned the cost in all genres in that period, a flowering that includes such random pieces of Americana as It’s A Wonderful Life and Leave It To Beaver, and, in particular, an ambivalence about America the superpower. Rod Serling was situated firmly in that tradition, and from time to time, his skepticism about war in general—and his anguish over World War II in particular—creeps its way into The Twilight Zone. It certainly does in “A Quality Of Mercy,” which is sort of a Platonic ideal of Zone episodes. It doesn’t deviate much from the most basic of formats the show pursued: A blowhard is shown the error of his ways via the vehicle of an ironic twist. Here, the blowhard is played by Dean Stockwell, and that makes all the difference. The story begins on August 6, 1945, the day of the detonation of the atomic bomb in Hiroshima, and that colors everything that goes forward. Stockwell plays a hotshot young lieutenant named Katell. He’s never seen active duty, but he knows that his job is to “kill Japs.” He pays no heed to the fact that his men are tired. He pays no heed to the fact that the mission he wants to send them on—to root out a bunch of Japanese soldiers in a cave just down the way—is a suicide mission. And he pays no heed to their insistence that it’s ultimately pointless to kill these men stuck in that cave. They’ll die soon enough, or the war will be over. What good are more lives added onto the massive pile of them over the years? Katell is having none of it. He’s over-the-top in the way of the best Zone villains, and he’s not afraid to insist that his men prepare to mount an assault on the cave. He drops his binoculars, and the weird part happens next: He’s tossed into the life of one Lieutenant Yamuri, in May of 1942. Yamuri fights for the Japanese in the battle of Corregidor (a major part of the battle to free the Philippines during the war), and he’s in a roughly similar situation. A bunch of American soldiers—some wounded—have holed up in a cave just down below. The Japanese commander is intent on rooting them out, and he tasks Yamuri to accomplish the task. No one pays mind to the fact that the Americans might be too wounded to fight back, or to the fact that those who can shoot will surely kill many of Yamuri’s men. The only emphasis is placed on dehumanizing the other side. You can see where this is going. Really, it’s a very, very simplistic story, the kind of anti-war tale that readily suggests itself when one contemplates putting a fantastical spin on an anti-war story. It probably shouldn’t work for a number of reasons, not least of which is the fact that Stockwell is given some makeup to appear Japanese in the segments where he plays Lt. Yamuri. (He also affects an accent that toes the line of racial insensitivity.) It’s like a catalog of things that should backfire or prove themselves too obvious but don’t, resulting in an episode that’s a little slow and talky (particularly for a war story) but also surprisingly involving. The dialogue Rod Serling’s script gives the soldiers on both sides is rich and evocative, and by the time Katell returns to his own side, the experience of being Yamuri has changed him in ways that clearly haunt him. 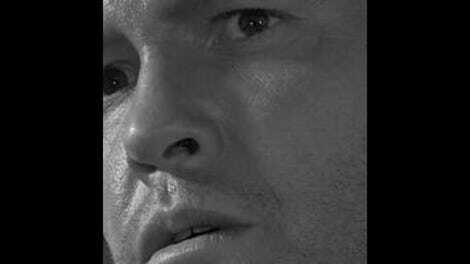 Stockwell’s performance isn’t exactly subtle, but he gets some nice moments in the conclusion, as his eyes take on the look of someone who has stared into the face of something deeply profound and has been shaken by it. That which is meant to be profound ultimately isn’t all that profound. The idea that we’re all human beings, so why should we kill each other is one that animates many an anti-war story, and while it’s true, so far as these things go, it’s also not exactly a brand new notion. Yet I don’t think Serling or director Buzz Kulik are going for that, not exactly. What they’re going for is the idea that being put into someone else’s shoes—literally, here—will cause you to realize that the human experience is not so very different from one person to the next. And that’s not the deepest idea either, so far as these things go, but it’s vividly portrayed here, and Stockwell’s eyes at the end do so much of the heavy lifting. This is a man who walked into the war eager to collect his first scalps and walked out haunted by the possibility of having to kill anyone. It’s not just any random encounter with the unknown that will do that. The artists so affected by World War II didn’t accomplish their goal of snuffing out war, to say the least. The movement died out in the mid-‘60s, because so many anti-war stories started taking Vietnam as the crux of their argument. It was easier to build that argument around a war many would call unjust than one that removed Hitler. And “A Quality Of Mercy” is a little over-obvious and doesn’t really go anywhere. But it’s still a surprisingly stark and beautiful portrayal of the mindset of Serling and those who agreed with him about the cost of war, and it offers at its core an obvious, if wrenching thought: The life you end may be your own. What a twist! : Lt. Katell learns that the Japanese are similar to his own side by being transported into the life of a Japanese lieutenant. As I watched this, I found myself wondering how the story would change by having Katell stay in the life of this Japanese lieutenant for the bulk of the war, seeing everything from the side that would eventually lose. I suspect it would prove too ambitious for a half-hour show, but it also might have made his shift at the end have more weight. Knowing the date is a nice thing for the audience, since we’re constantly aware that Lt. Katell’s suicide mission would prove pointless if he launched it, but it sometimes seems as if the soldiers under Katell know what’s happening as well, which is more problematic. The great casting doesn’t begin and end with Stockwell. Leonard Nimoy is here in a smallish part, as is the character actor Albert Salmi. And Dale Ishimoto, who sometimes seemed to only find work as Japanese soldiers in this period, makes the Yamuri section involving. I have a grandmother who’s outlived nearly everyone in her life. She moved to Canada and then the United States from Germany at a young age, leaving behind everyone she knew as a child and young adult. She’s lost a husband, two children, and a grandchild, and the weight of those losses is always evident in her eyes and the way she carries herself. For years now, she’s been ensconced alone in a house that’s probably too large for a woman of her age, and now that she’s finally sold it (to move in with her one still living child), she seems to be deeply sad about the loss of that, too. The house might have been more of a burden to her than it should have been at this point in her life, but it was also a repository for her memories, a place that held so much of who she was and had been. Now that, too, will be gone. The place she’s moving to will be better for her physically, but I’m not sure that her emotions can bear the brunt of it. The last time I saw her, my wife and I came in late after having met with other family for drinks. She had fallen asleep in her chair, so I resolved to quietly wake her and send her to bed. Instead, she launched into a 90-minute monologue that was about nothing more than attempting to keep us awake, about telling us all of the things she had experienced and lost, because we were the receptacles for those feelings and thoughts, the people who might hang onto them long enough to carry them with us. Being with her is a joy—I don’t have that many grandparents left, and her life story is genuinely fascinating—but it can also be like trying to assemble four 5,000-piece jigsaw puzzles at once. There are stories running through her monologues, but putting them all together takes time and effort, things that are in short supply at 1 in the morning. In her way, she reminds me of Wanda Dunn, the woman at the center of “Nothing In The Dark.” Like so many elderly people, Wanda has closed herself off from the outside world as much as she can, preferring to live in a tiny space crowded with objects and memories from her past. Unlike those people, who often seem to simply be waiting for death, however, Wanda is deeply terrified of death, of the idea that a kindly young man’s smile will give way to her disappearance from this Earth. Wanda saw the face of a man on a bus once, and then he touched the fingers of an old woman. That old woman died, and Wanda kept seeing his face, just in different people. Mr. Death is out there, but if she closes herself off in her apartment, he can’t get to her. “Nothing In The Dark” is something of a master class in how a great ending can make a somewhat lackluster episode come together. 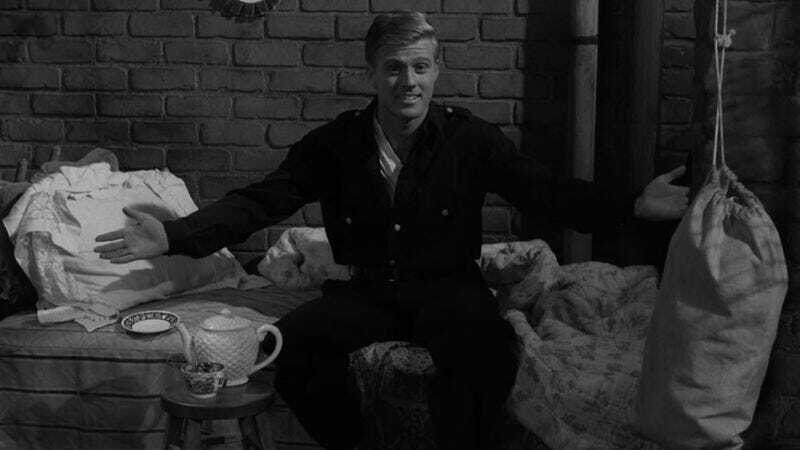 There’s nothing wrong with the first 20 minutes of this episode, but they also revolve around one idea that seems fairly obvious: Wanda is terrified of opening her door to Mr. Death; now that she’s opened her door to a charming young man played by Robert Redford, it seems likely that he will turn out to be Mr. Death. The genius of “Nothing In The Dark” lies in the way that it lulls you into a state where you no longer suspect Redford’s character, Howard Beldon, much as he lulls Wanda into that false sense of security. By the time R.G. Armstrong has turned up as a contractor who’s been tasked to tear down the tenement building Wanda has holed up in, the focus has entirely shifted to how Wanda will confront her fear of going outside. And then the contractor walks over to where Howard is lying in bed, recuperating, and doesn’t seem to see him, and you know. Really, it’s beautiful. The last five minutes of this episode are fairly staggering, as Howard reveals himself to be nothing more than a friendly young man who wants to take Wanda to the next step of her journey. It’s one of the more comforting portrayals of death that I’ve seen, made all the more remarkable for taking place on just the one set. As Howard, Redford uses all of the charm that he would put to such good use as a big-screen icon to put this one woman—and the audience standing just behind her—at ease, and when he turns up the charm even more to convince her that he doesn’t mean her ill, it becomes that much more effective. In the last five minutes, Redford plays Death as almost a religious figure, spreading his arms wide, then grinning at her with that famous smile and extending his hand, asking her to take it. It almost makes you wish someone had contrived a reason for him to play Jesus. None of this would work without Gladys Cooper as Wanda, however. In the early going of this episode, it almost seems as if Wanda lives in some sort of political dystopia, where police officers are gunned down in the streets and ordinary citizens hide out in their apartments, terrified of “Him.” And as the episode goes on, it’s a little disappointing just how small-scale this all is, just how much it’s really just about an old woman scared of Death who invites a policeman suffering from a gunshot wound to recuperate in her apartment against her better judgment. But the further the episode gets into what’s happening and the more invested the viewer gets in whether or not Wanda will have to leave her apartment, the more apparent what’s been going on all along becomes: Wanda does live in a dystopia. It’s just a post-apocalyptic landscape of her own making, a world so pockmarked by craters of regret that she can’t so much as step outside. Cooper’s performance sneaks up on you. At first, she seems a dotty old lady with a very strange accent. By the end of the episode, though, she’s something else entirely, a pilgrim on a journey she’s finally ready to undertake willingly. She’s a woman who lets go, just a little bit, and that makes it all the more moving when she looks back and sees herself lying on the bed, passing away. The image that plays underneath the credits of the episode is of Wanda’s hand slipping into Death’s at long last, and it’s an image at once poignant and haunting. How much of life did Wanda miss out on, running from someone who would inevitably catch her? How much was lost to her because of her self-imposed vigil? We all might hope we’ll be brave enough to face death head-on when it comes—or at least to be at peace with it in that moment—but so many of those Mr. Deaths Wanda saw didn’t have the charming face of Robert Redford. Maybe that’s the necessary fate of everyone who lives long enough to know that Death could be hiding behind even the friendliest of smiles, could come at any instant: being trapped in a home full of memories that won’t go away, longing for someone to pass them onto and never knowing if you’ll have enough time. What a twist! : That nice young policeman Wanda invited into her house (played by Robert Redford!) turns out to be Death incarnate. The image of Rod Serling in the mirror when he gives his opening narration is a little jarring until the camera reveals what’s happening. It gets a nifty payoff, though, when Wanda turns to realize that Howard isn’t reflected in her mirror. I singled out Redford and Cooper for praise above, so why not Armstrong as well? He takes what could have been a nothing part and imbues it with a kind of tenderness. He’s technically a “villain” in this piece, but he makes the part of his job where he has to kick old ladies out of their apartments seem like the worst bit of what he does. Lamont Johnson’s direction is really exquisite here, particularly the use of light as Wanda joins Death for her final walk.